Hello again! Well a busy winter turned into a busy spring, which turned into a busy summer, and here we are almost at the end of it and getting ready for fall already! What have I learned? Life is busy and doesn't slow down, I just need to catch up. I have had a couple of big projects on the go. First, I have been working on a table (grown-up sized for a change of pace) which I would like to share with you. And the other project has been working on transforming my front yard... and wow, was that ever a big job! At times it made me think I would love to do landscaping for work, and at times I felt grateful that it isn't my job! I'll share some of this project with you in another post. A dear family friend, and a woman of impeccable taste and style, asked me a while back if I would help transform her kitchen table. At first I had to double check that she meant to ask me, and not my very talented sister at Vintage Prairie Style. She is amazing, and her pieces are always sophisticated and stylish, and it is what she does. However, I had done a typewriter child's table for her two grandsons and she did want me to do it... So once that was cleared up, off I went to her house to take a look at the table and sketch some ideas out with her. This lady is known for her love of black and white and of stripes and polka dots. Dotted around her kitchen are beautiful MacKenzie Childs pieces. The inspiration was settled on straight away, and off to work I went. 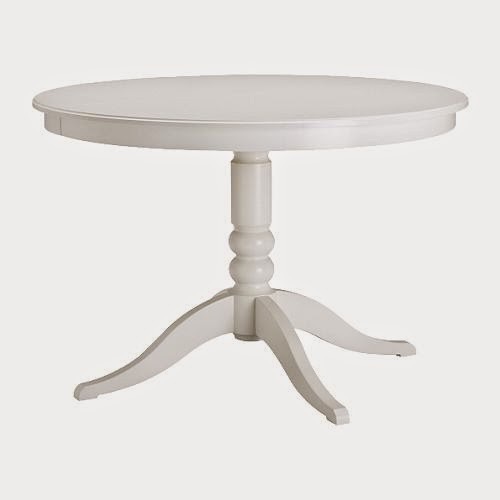 We started with her IKEA Laitorp table in white, stripped it down bare and repainted it. This is my first use of the General Finishes Milk Paint, and I have to say, I loved it! I used Snow White as the base colour and added Lamp Black stripes, checks and polka dots... of course. 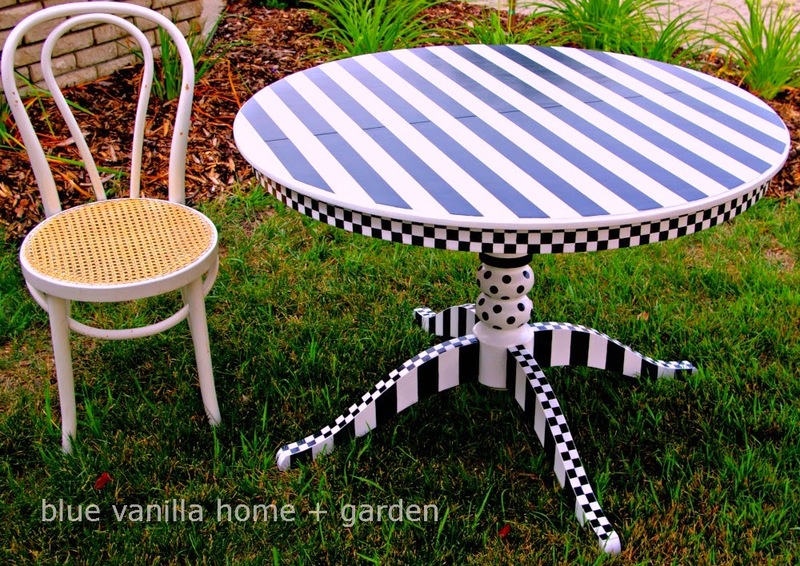 After: A black and white table of classic patterns. The table is finished and on its way back home. I am still plugging away on my yard, and I will come back to that on another day with some before and after shots. And I am working on some pretty little wild flower stools to go with a Matryoshka Doll child table I have recently done, and I look forward to sharing those pictures. And I am working on a new pink rose child table with some throne chairs that will be featured in a girls room of a showhome opening in September, and a barn child's table and stools as well. I would like to finish a slipcover for a cheetah print chaise in my family room that has been bothering me for going on four years, and do some furniture and wall painting in my own home. On top of that back-to-school is coming upon us rather quickly, along with all the extra curriculars starting up again, and we just keep adding irons to the fire.